Lawn and Veranda Talks Proposed During Heated Season. Lawn and veranda meetings will be resorted to by the suffragists in pushing their campaign for woman suffrage, during the warm weather. A series of veranda meetings is being arranged by Mrs. A. E. Clark. Other suffrage workers are also arranging meetings. Tomorrow forenoon a meeting will be held at the residence of Mrs. R. R. Hoge, 731 Everett street. A paper will be read, and the suffrage question generally discussed. 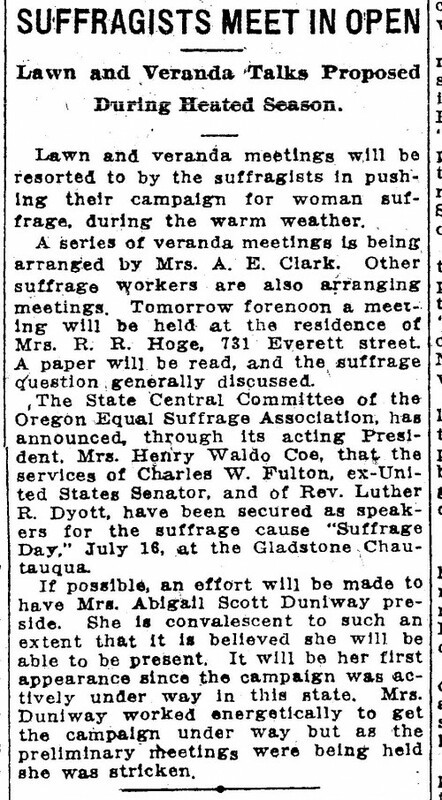 The State Central Committee of the Oregon Equal Suffrage Association has announced, through its acting President, Mrs. Henry Waldo Coe, that the services of Charles W. Fulton, ex-United States Senator, and of Rev. Luther R. Dyott, have been secured as speakers for the suffrage cause “Suffrage Day,” July 16, at the Gladstone Chautauqua. If possible, an effort will be made to have Mrs. Abigail Scott Duniway preside. She is convalescent to such an extent that it is believed she will be able to be present. It will be her first appearance since the campaign was actively under way in this state. Mrs. Duniway worked energetically to get the campaign under way but as the preliminary meetings were being held she was stricken.